Synopsis: Dakota North #5 opens with Dakota, Amos and Ricky bound to chairs in Sheik Ibn Bheik’s Grindelwald, Switzerland castle after being captured at the end of the last issue. The Sheik’s henchmen search the prisoners but are unable to find the pen containing the top secret nerve gas that they’ve been seeking. After explaining the situation to her very confused brother, Dakota goads the Sheik into attacking her with his hunting falcon and she manages to break free of her bonds after breaking her chair while dodging the vicious bird. Back in New York, SJ North bickers with Major Cooper at length about the situation in which he’s placed Dakota and Ricky. Major Cooper is amusingly nonchalant about the whole thing, saying “But SJ! The boy can’t do much damage! There’s only enough gas in the pen to wipe out a few city blocks!” SJ North is not amused. SJ learns from Mad Dog that Cleo Vanderlip is involved with the mystery. “Cleo Vanderlip!? I thought she was dead! If shes’s involved in this affair, then heaven help us!” Clearly there’s some history between the two. Heading west on an airplane over the Atlantic, Daisy Kane stresses that Cleo is going to kill her when she find how badly she messed up her job since she was supposed to trap Ricky, not fall for him. In New York, fashion designer Luke Jacobson unveils his latest designs for Cleo who reacts badly when she sees that they all look like Dakota North. 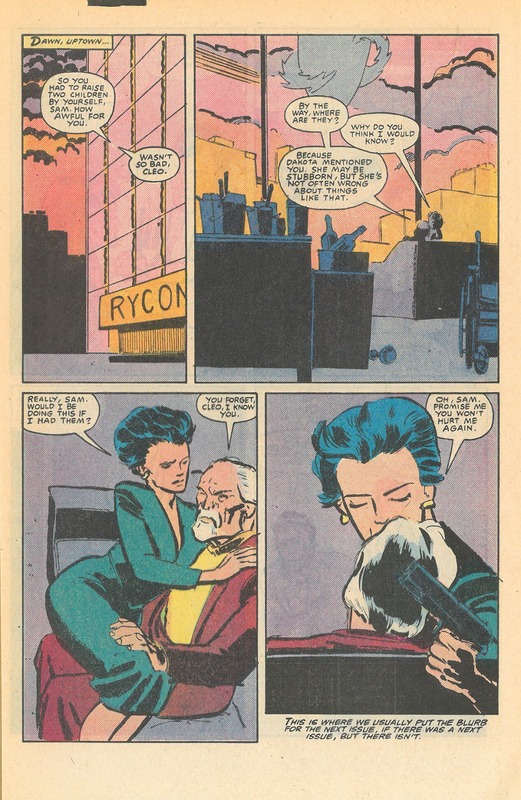 Luke says that he can’t get the detective out of his mind and that she’s the woman of the 1990s. While this exchange occurs, SJ North sets up for Rycom’s headquarters, determined to confront Cleo. In Grindelwald, Dakota frees her brother from Sheik Ibn Bheik while Amos manages to trip the villain who is electrocuted by a TV when he falls in a puddle of water. As the three fight against the Sheik’s henchmen, Ricky plucks the missing pen from the pocket of one of the minions where he hid it while they were being searched. 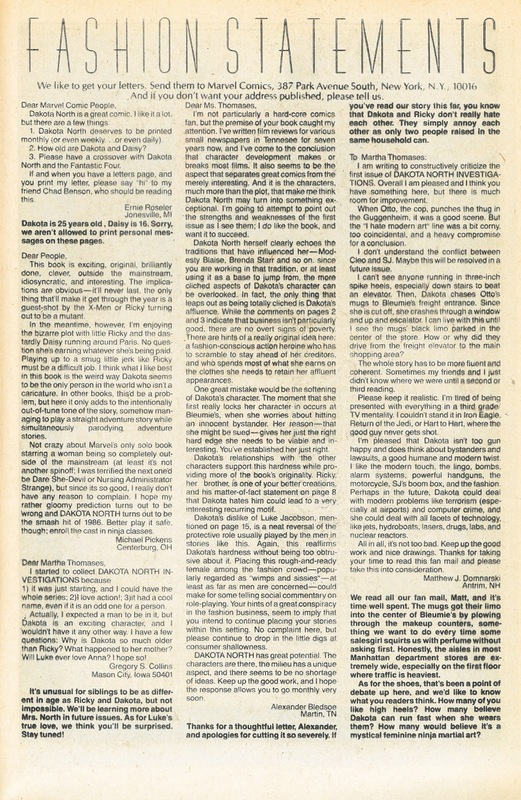 The boy threatens to unleash the nerve gas and the thugs surrender, providing the opportunity for Dakota, Amos and Ricky to make their escape to the Sheik’s garage where they find a fleet of cars read and waiting. Dakota tells Amos that it was sweet of him to help, but he replies “Dakota, I didn’t put my job in jeopardy and traipse halfway around the world for a peck on the cheek.” Cue the80's make out music. 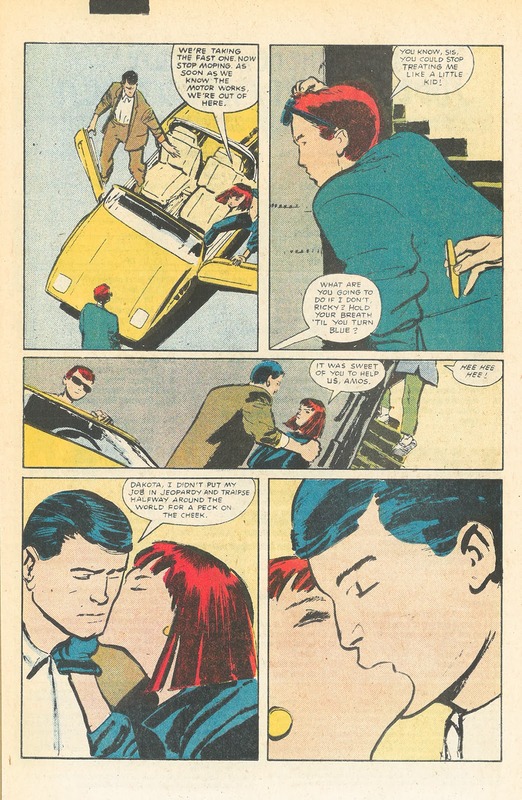 As the three prepare to make their escape in a yellow Ferrari, Ricky realizes that the pen is missing. One of the Sheik’s henchmen picked his pocket and now finds himself in a position of power for the first time in his life. “I have the pen, now I shall rule the world!” he declares. “Not while I live, small one.” replies the Sheik. 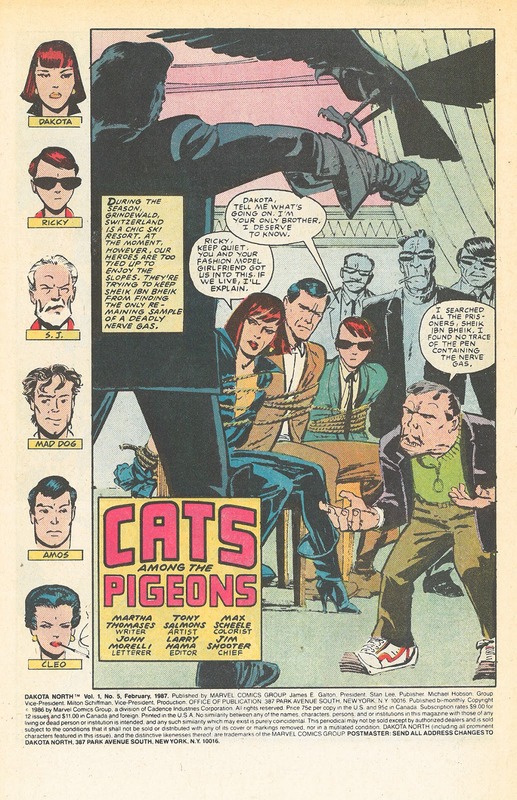 The nerve gas is released in the ensuing scuffle, leaving all the villains dead. 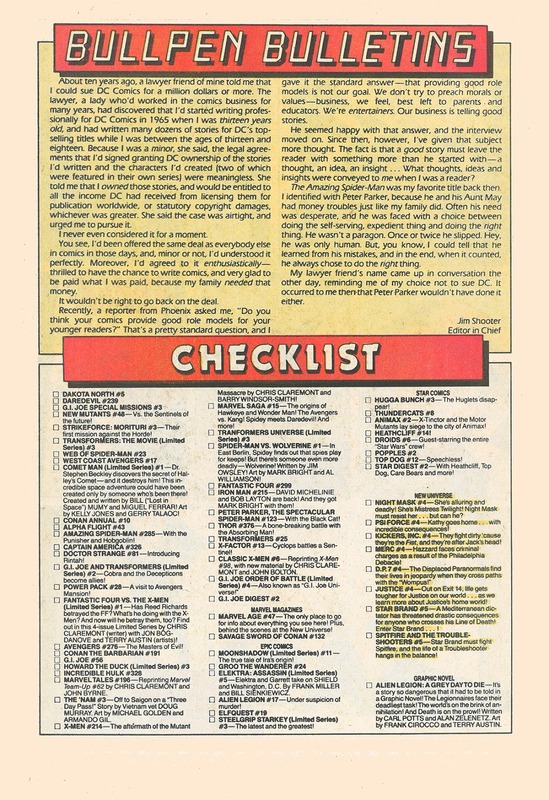 Where teaser for the next issue would be, it says “This is where we usually put the blurb for the next issue, if there was a next issue, but there isn’t.” Not even the Fashion Statements letters page had any further explanation, but we now know in retrospect that Dakota North was canceled due to lackluster sales. 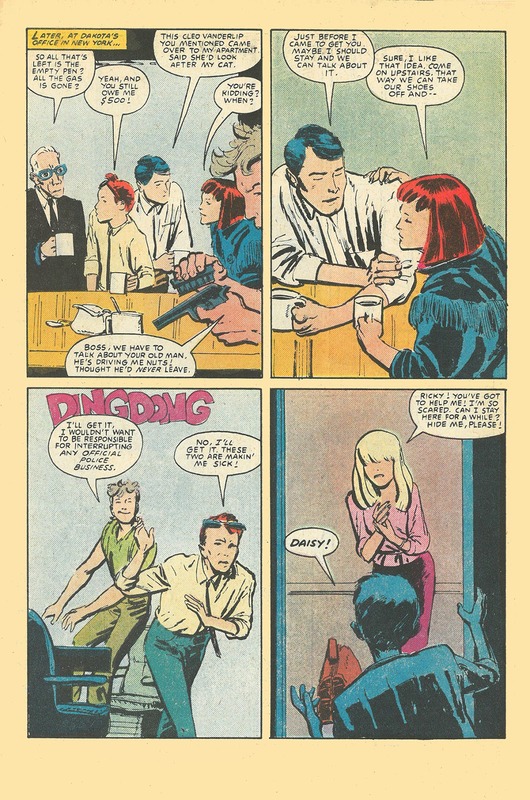 Despite its many flaws, Dakota North as a series is a great artifact of the 1980s and an interesting attempt by Marvel to expand into a new genre. 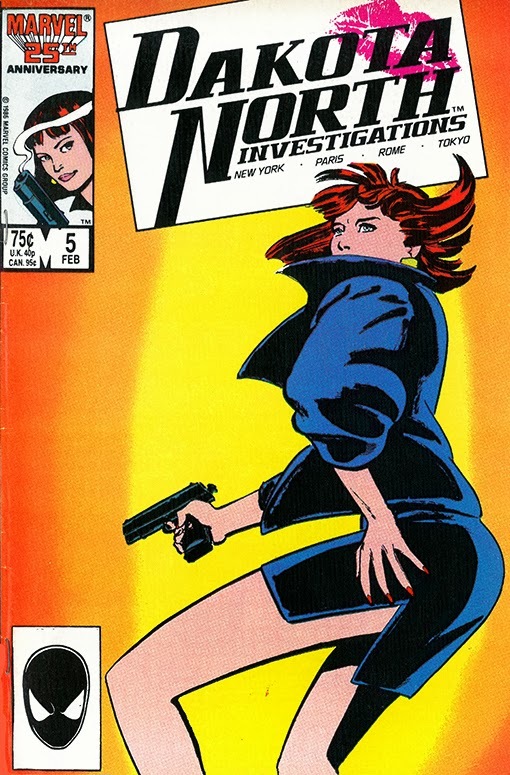 Dakota North as a character remains active in the Marvel Universe and has appeared many times over the years, most recently in the fantastic Daredevil run by Ed Brubaker and Michael Lark where she played bodyguard and then love interest to Matt Murdock. 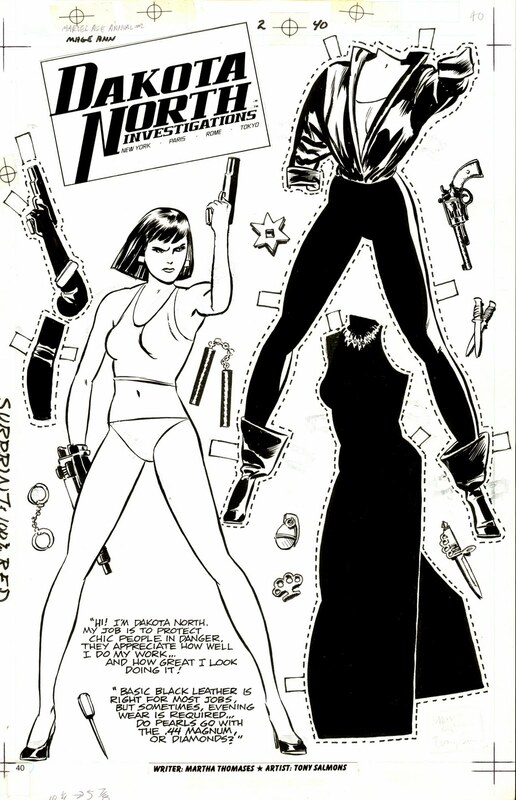 While the series ended after only five issues, colorist Gerry Turnbull had some fun with the Dakota North paper doll that appeared in Marvel Age Annual #2 (1986) and produced another three mock covers. Michael Lark also did a number of great 80's inspired Dakota North commissions for me in in 2012.